The unique ability of film to instantly reach millions has made it a potent tool of political persuasion. Here are ten films that carried the torch of liberty into the battle of political ideas — and won. Brexit: The Movie, which argues with devastating persuasiveness the case for Britain’s exit from the EU, was produced on a budget of just £300,000. For a film with ambitions to change the UK national conversation, that is not much money. Nonetheless, through sheer merit, Brexit: The Movie was viewed in a brief span of months an incredible 2 million times — more than the razor-thin vote spread between Remain and Leave. Was it the deciding factor that tipped the scales? Impossible to say, but it clearly helped. Given that EU proponents are still trying to claw their way back to making the UK a vassal state of a US-style centralized federal government, the utility of this excellent film may not yet be exhausted. Director Martin Durkin is one of the most talented political documentary filmmakers of our time. His previous credits include three additional libertarian films: Margaret: Death of a Revolutionary, Britains Trillion Pound Horror Story, and The Great Global Warming Swindle. In 2013, while the Obama administration and its talking heads were busy claiming that there was no domestic spying program, and doing everything possible to discredit whistle-blower Edward Snowden (with the cooperation of a compliant liberal media), documentary filmmaker Laura Poitras was quietly preparing to rip the lid off of their well-orchestrated narrative with her bombshell documentary Citizenfour. Using actual footage from Snowden’s initial conversations with journalists, held in secret in a Hong Kong hotel room, Poitras wove together a story so compelling it made Citizenfour as much edge-of-the-seat thriller as documentary, and the film ultimately won the Academy Award for Best Documentary. Over night, Edward Snowden went from household name to household hero. Advocates of unrestricted surveillance have been on the defensive ever since. The Oliver Stone film Snowden is likely to carry this ball further across the finish line. As evidence of the importance of this film, the US government has given director Laura Poitras its highest enemy-of-the-State honor: constant surveillance. Dallas Buyers Club tells a story of breathtaking incompetence and cold-blooded arrogance on the part of the medical establishment and the FDA, in the context of one AIDS victim’s fight to save himself and others. Perhaps for that reason, the script was rejected 137 times by Hollywood execs, and nearly given up. At the last moment an unlikely financier, a Texas fertilizer entrepreneur, decided to take a gamble on it, financing half of its tiny $4 million budget. It was filmed in just 25 days. When Dallas Buyers Club was finally released, it won three Academy Awards and was nominated as well for Best Picture. The film puts the FDA’s obstinate demand for absolute control of pharmaceuticals, defended for decades on grounds of public safety, into an altogether different light — it turns out you can be too safe, like when you’re dying and the agency won’t allow you have access to experimental meds because…safety first. After the film’s release, the Right to Try movement got a second wind, and patient rights bills have been popping up with increased frequency. In 1993, a conflict occurred between a reclusive religious group, the Branch Davidians, and various state and federal law enforcement agencies (assisted by the US military). Dozens of people were killed, including children. Initially, the Clinton Administration was able to pull off a masterful narrative campaign to explain what happened, painting a picture of right-wing religious nut-cases shooting police officers and then meeting a well-earned fiery demise. Then Waco: Rules of Engagement hit the theaters. Step by step the government’s version of the story was unraveled, and in its place was left a holocaust that could only be attributed to an incredible abuse of state power. The high quality of this film, and its consequent Academy Award nomination, gave it credibility with all corners of the political spectrum. Ordinary people suddenly realized, yes, it can happen here. The film was a watershed event in the handling of armed conflicts, with priorities subsequently changing from rapid resolution to minimization of loss of life. The phrase “we don’t want another Waco” remains in common usage. After the Cuban revolution, here and there refugees began appearing, telling stories of death camps for gay people and for others Castro deemed “undesirable.” The scattered claims of abuse were haughtily dismissed by liberal journalists and angrily denied by Cuban authorities. The Left had wholeheartedly maintained a narrative that socialism was a paradise for gays; the stories simply could not be believed. Improper Conduct grabbed that narrative by the throat and squeezed until the truth came out. It is probably the most effective documentary ever made about socialist repression of personal liberty. The particular genius here is that it is the testimony of actual Cuban refugees, dozens of them, that gradually builds a damning and irrefutable picture of what it’s like to live in a “worker’s paradise.” The stories they relate of the labor camps to which they were sent are consistent, shocking, and very credible. This documentary was awarded the Grand Prix at the Twelfth International Human Rights Festival and is one of the very few on this website to earn the highest score in both libertarian content and production quality. After the release of Improper Conduct, never again could the Left claim that Cuba was a human rights model to be emulated, without that awkward subject coming up…death camps for gay people. Free to Choose brought the subject of free markets into America’s living rooms, and was seen by millions thanks to nationwide airing on PBS. In this series, Friedman guides the viewer through ten documentary-style lectures on the workings of the market and its relation to human liberty. The series made a case for economic freedom so lucid and persuasive that it may even have helped elect Ronald Reagan in 1980, and in any case certainly gave intellectual support and respectability to free market reforms put forward by both Reagan and Thatcher. Free to Choose remains the single most comprehensive series on economic liberty ever produced, and although now decades old it’s still firing on all pistons and is available free online. It’s a testament to the power of Friedman’s then-radical proposals — and perhaps this series itself — that some have already been implemented and others have become common subjects for discussion. The Incredible Bread Machine was not a major motion picture. It was not even a minor motion picture, inasmuch as it was largely distributed on film reels between interested individuals and clubs, without ever being shown in a commercial theater. But it had power beyond its production and distribution budget, for the simple reason that it spoke a forgotten truth at just the moment when at least some were looking for that truth. In 1975, there was no Cato Institute, no Drug Policy Alliance, no Mercatus Center, no Students for Liberty. The Libertarian Party had been founded just four years earlier in someone’s living room and was a party more in theory than practice. Reason magazine, originally a mimeographed handout, had only been printed as a regular magazine for five years. The very concept of libertarianism, the very word, was new and unknown outside a small group of dedicated people. So how did it initially spread and grow, to the point that today anyone in politics reaching for political respectability claims to be at least “somewhat libertarian,” and the party’s presidential candidate is scoring 10% in the polls? Enter WRI Education, a small group of dedicated libertarians who had the crazy idea of spreading their ideas through film (at the time an expensive and uncommon thing to do). The high point of their work was The Incredible Bread Machine, and the less well-known but award-winning Libra. These two films were like rain on an intellectual desert. Directed at college and high school audiences, they articulated the concepts of liberty in a fun, entertaining way and thereby helped to recruit that first wave of young advocates who transformed the fledgling movement into a global intellectual force. These films are now dated, but are nonetheless interesting in their own right as a window into the early libertarian movement. Victim was a revolutionary film and an act of courage for all involved. At the time it was made, homosexual activity was a serious offense in Britain, not to mention held in wide contempt. Its illegality spurred a virtual crime wave of blackmail against gay men. In fact, ninety percent of all such cases were gay related. The story concerns one such young gay man who is being forced to pay money, or face exposure and prison. When he commits suicide rather than go through a police inquiry, a closeted bisexual barrister avenges his death and fights the law responsible for it. Six years after the the film’s release, homosexual activity was decriminalized in Britain. Victim has been specifically cited as the catalyst for the liberating Wolfenden Report, which made the political case for legalization. A series of Pulitzer Prize-winning articles, first published in 1948, ripped the lid off of union corruption and exposed the devastating effect it had on the lives of ordinary workers. On the Waterfront broadcast that news into every theater across the country and made it part of the national conversation. Up to that point, unions had largely been seen as beneficent organizations that dutifully protected the interests of their workers. The idea that the union leadership might be corruptible and self-serving, even criminal, was a revelation. Union reform followed, membership declined, and unions never again saw the high-water mark of the 1950s. Eight Academy Awards (including Best Picture) were heaped on this film and for good reasons, including: tight direction, inspired acting, Leonard Bernstein’s energetic music, and a brilliant script. Marlon Brando was born for the leading role and gives a remarkable performance as a rough-and-tumble bruiser, cynical and gritty on the outside but with a heart that melts in the hands of virtuous Eva Marie Saint. 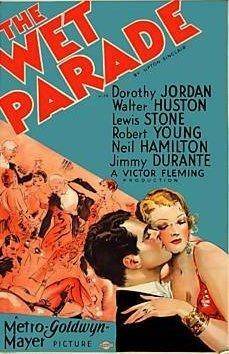 In 1931, Upton Sinclair published The Wet Parade, a novel about the harmful effects of Prohibition. A year later, Victor Fleming turned that novel into a powerful film. It tells the story of two families in early twentieth century America. Each is plagued with the problems of alcohol addiction. Prohibition it is hoped will end those problems, but instead makes things infinitely worse. A year after The Wet Parade hit the screens, Prohibition was repealed.